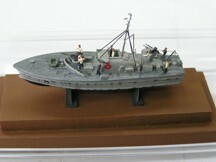 "MGB 75, is from a White Ensign Models kit to 1:350 scale and part of their ‘Narrow Seas’ range. 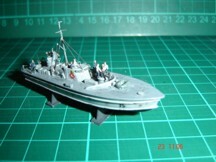 MGB 75 was a British Power Boat Co. 71’ 6” gunboat commissioned in July 1942 by LT ‘Tommy’ Ladner, RCNVR and was allocated to the famous 8th MGB Flotilla, who’s SO (Senior Officer) was the legendry LT CDR Robert Hichens, DSO & bar, DSC & 2 bars, RNVR. The flotilla operated in the English Channel and sometime in late 1942 MGB 75 was very badly shot-up off the French Coast suffering a large number of casualties and was de-commissioned for a considerable time. 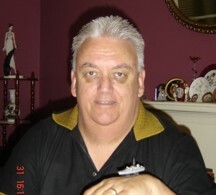 Tom Ladner, after a short leave was posted to command MGB 663, a much larger Fairmile D class ‘dog boat’ and served with great distinction in the Mediterranean. I had the personal privilege to actually speak, albeit briefly with Tom shortly before his passing on 23rd June this year, he was 89."